In the west, Christmas is a season weighted with expectation. We tie every family obligation, every regret and disdainful look, to the fragile boat of Christmas until the thwarts are covered, the deck dangerous to traverse and the gunwales in danger of shipping water. Then, with no attention on the possible shoals and reefs of seasonal depression and family feuding, we wish most desperately for our better nature to the come to the fore. We ask the season foundering with our hopes and dreams to weather the hurricane of a child's simple delight and slip over the soft gravel bar of half-uttered endearments. 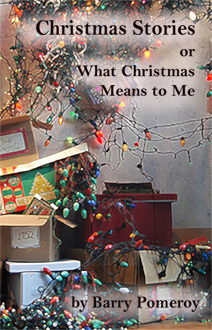 With these stories I have tried to capture the materialistic urges, the chaos and family delight, the chance for vindication and escape from the frigid cold of family relations, the wish to spread the seasonal franchise, the connection to the invisible and fantastic, the devastation of children and their caregivers, and finally, presents. Burning Richard - For some, Christmas is a time of rare opportunity. Cindy has been planning for her holiday season for years, and if everything goes right, her life will completely change with the new year. A Gamer's Christmas - Evan had the season wrapped up in his own dreams of giving, but when a present drops into his lap he realizes how paltry his dreams had been. The Goods on Christmas - The story of a Christmas in-law visit gone horribly wrong in the breathless voice of the late Dr. Hunter S. Thompson. This is as much a treatise on North American Christmas celebrations as it is a story about a particularly cold mother-in-law matched only by the frigidity of the northern winter. The Crèche Artist - Dianne's favourite season is Christmas and her favourite task building crèches. Perhaps that's why she is horrified to learn that someone is subtly vandalizing her work to make a strangely significant statement. They're Dreaming of a Non-White Christmas - What if Aboriginal people woke up on Christmas morning with the greatest present of all? A story as much about our history as it is about our present. Alone for the Holidays - Being alone at the most family of seasons is bad enough for most people, but for Ben, who sought solitude all of the year, Christmas had always been a nightmare of cheer and good will. This year would be different. What Did Santa Bring Me this Year? - A meditation on materialism as much as it is about invisible gods, this polemic explores the connections between one fanciful story and another. Christmas is Totally Ruined - When a girl loses her brother on Christmas, her reaction is anything but in tune with the season. The Best Present Ever - When Frank wants to give his remote daughter the best Christmas he can, he labours for days just to see his daughter's face light up as she sees the best present ever.